I am so excited! 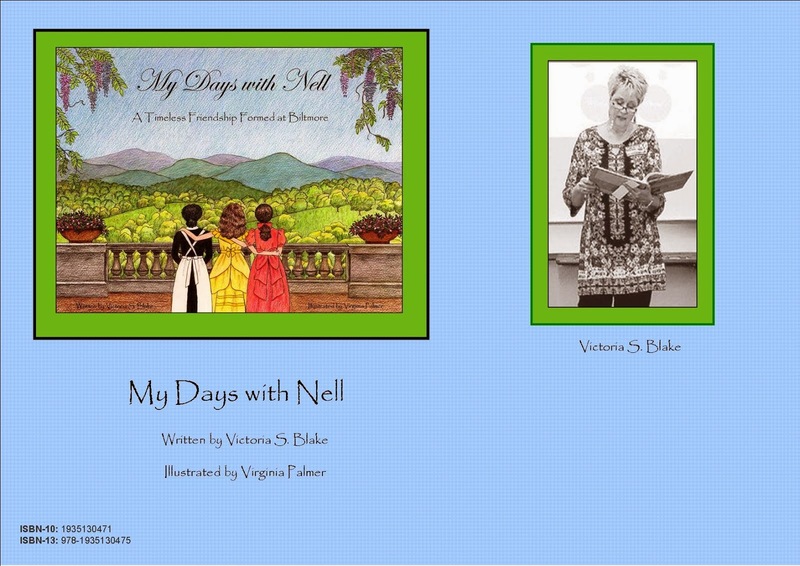 A very special lady, Mrs. Vickie Gray, called me recently and invited me to Haywood County to present the writing process for "My Days with Nell". Mrs. Gray is a precious friend of mine. We worked together at West Marion Elementary for years and shared many days of laughter and tears... mostly happy tears. She is a wonderful lady. She is a wonderful mother. She is a wonderful grandmother, I know. And she is a sister in Christ to me. I can't wait to see her and "catch up". I am planning to speak with the fourth grade students at Meadowbrook Elementary School on April 9, 2014. It is my understanding these fourth graders will be going on a field trip to the Biltmore Estate on Friday, April 11, 2014. That will be perfect! I love to speak to students right before a field trip...I will have a few special things to share with them. Hopefully my visit will peak their curiosity and interest and will enhance their visit. I can't wait to see Mrs. Gray and the students at Meadowbrook! I will be there soon! I treasure the days when I know God has just smiled down on me. Today was one of those days! I had the privilege of speaking at Greenlee Baptist Church with their "Young at Heart" group. My precious mother went with me and from the moment we entered the door, we were met with open arms and warm smiles. Such a loving and welcoming group of senior adults! We had the most delicious meal of good ole country cookin'... food that one can not possibly purchase in any public restaurant! We had the sweetest time of fellowship, devotion and prayer. I especially appreciated the devotion on love...it touched my heart. Sometime in January, 2014, Ms. Ruth Coward, called and asked if I would come and speak about, My Days with Nell, to these seasoned adults who were "Young at Heart". Sadly, "Mama Ruth", as she was affectionately known by so many, passed away last week. She was a wonderful woman who touched so many lives with her excellent nursing skills, compassion and encouragement. Many folks shared their fond memories of her life and friendship and her presence was definitely missed by her friends at Greenlee and by me. This was the first presentation I've done outside a school environment. These folks were awesome...I received so many wonderful comments and I truly appreciate those kind words. I basically shared information based on the research I did while writing my book. I hope I was able to enlighten them with some facts about the Vanderbilts and their home. It is always my desire to present the Vanderbilts as generous, hospitable and loving people. . . as I believe them to have been extraordinary people of hope and vision. Maybe that's why I love to go to the Estate so often. I always sense hope when I am there.... hope that great things come out of small beginnings. I think George Vanderbilt was a visionary; he saw barren, overworked farm land and imagined wonderful... almost magical things that would arise from the soil. Biltmore is where his dream came true and his hopes of a self-sustaining estate came to fruition. So for me, hope lives there. As I visit all different groups of people, either young children or young adults or even those that are "Young at Heart", God continues to show me hope and how His grace is sufficient. . . in all things. The folks at Greenlee showed me His love and were His hands, His feet, His warm embrace, and His love was shown through them as they accepted me at their table and in their midst. I was blessed today by these people who through something as simple as a meal together, and a few words from the "good book", took the time to share the love of God with me and my precious mother. And where the love of God is - there is always hope. The hope for this world is Jesus. For I know wherein my hope lies... The hope for us all lies in Jesus Christ. Thank you, Greenlee Baptist and "Young at Heart" for inviting me to visit with you. It was a great day for me!